I’m going to start right here. 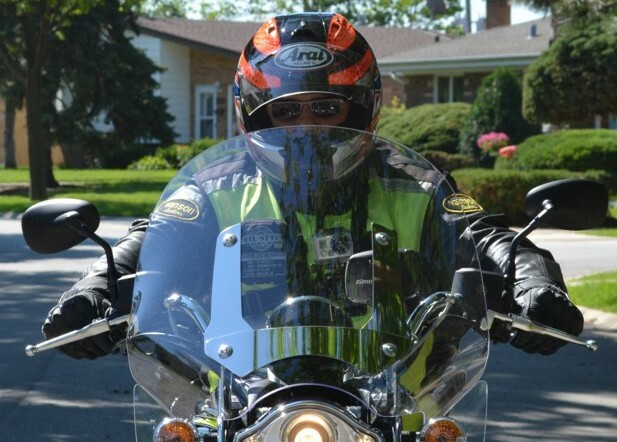 This motorcycle weighs about 307 pounds without the fluids. The fluids would include oil, fuel and coolant. So let’s add another 20 pounds to be on the safe side. So the approximate weight of this motorcycle ready to ride is 327 pounds. That’s about 100 or so odd pounds heavier than a competitive motocross motorcycle. Eat enough Wheaties you could probably carry this motorcycle around by strapping it on your back. The liquid cooled single cylinder engine generates about 44 HP. That seems like a lot of power for something that has only 375 cc. My Honda lawnmower has 159 cc and produces 6 HP on a good day. The four valves are controlled by two overhead cams. Yep, this little engine has four valves per cylinder. It’s all about moving gases through the combustion chamber with the least resistance. The engine is equipped with two oil pumps to keep all the moving metal parts nice and slippery. The engine weighs in at 80 pounds, let me guess, without fluids? I’m a big fan of KTM’s engine design. First off, the outward appearance of the engines looks way mechanical, dude. Like every square inch has something to do with producing more HP. No fancy curves or any intrusion of arties stuff to increase the visual appeal of the engine. This baby is all business! On paper KTM’s engines seems to have a higher power to weight ratio than other manufacturers. A state of the art injection electronics system keeps the fuel following into the combustion chamber without a hitch. Throttle response is spot on without delays or mishaps. The engine revs up quickly so you better be prepared to use the gearbox. Failure to use the gearbox correctly will introduce you to the rev limiter indicator on the display on a regular basis. The engine is coupled with a 6-speed gearbox. The clutch is in an oil bath and has multi–plates. No slipper clutch on this baby. The clutch is not hydraulic assisted. But it had a very light pull on the lever. The transmission worked like a charm. The only problem I had was the length of shift lever. Way too short for my size 11 boots. Missed a few shifts because of my boots. The frame is composed of tubular steel. The frame design looks pretty ridgid with some beautiful welds. The swing-arm is composed of lightweight alloys and is manufactured from some type of die-casting process. If you look closely at the swing-arm, it does look pretty cool with the bracing design. The frame and the rims are painted KTM orange, no big surprise there. The front forks are inverted with a hefty 43 mm thickness. The suspension duties in the rear are handled by a mono-shock right smack dab in the middle of the swing-arm and the frame. According to KTM, the suspension travel in the front and rear is 6 inches. That seems like a lot of travel to me. It might be a misprint from KTM’s website. This motorcycle has a pretty big front brake rotor. 300 mm big! The front calliper has four pistons and the rear has one. With this braking configuration, I see a lot of stoppies in the future for this motorcycle. Way cool, ABS is standard! I believe KTM is staying ahead of the curve by putting ABS on this motorcycle. The EU is going to force motorcycle manufacturers to have ABS braking systems future. The EU is going to be a big market for this motorcycle anyway. The 17 inch rims are a light weight casted alloy material. The rims are equipped road griping Metezeler tires. There’s 110 mm in the front and 150 mm in the rear. This combination should keep this motorcycle well planted on the road regardless of the driving conditions. The seat is about 31.5 inches off the ground which should be a good fit for a lot of motorcyclists. The seat is pretty damn comfortable for this type of motorcycle. Usually they give you plank with ¼ inch of foam and some cheap vinyl covering. The seat was actually very comfy, not La-Z-Boy comfy, but comfy none the least. I wasn’t a big fan of the speedometer in the beginning. It looked cheap and out of place. But during the demo ride, I learned to embrace it. It was easy to read in any of the sunlight conditions during that day. I wished the tach portion was a little bit bigger on display. What was it like to ride the KTM 390 Duke? First off, the motorcycle feels small, almost tiny. I can’t see this motorcycle being a good fit for some over 6 feet in height. The second thing that comes to mind is “fun.” Even though this is not the motorcycle for me, it did hit the “damn cool” level in the motorcycle section of my brain. During my demo ride, the frame felt rock-solid as I pushed it through the turns. The suspension worked like a charm handling my mass during the ride. I did on one occasion squeeze the front brake lever too much causing the front end to dive. After that, I adjusted how I used the front brake. Every motorcycle has a learning curve. The engine provided plenty of get-up-and–go. There’s also a restricted version of this motorcycle to comply with the UK’s A2 driver’s license category. In the UK, new riders have HP restrictions on their motorcycles. In the good old USA, a new rider can go directly to a 200 HP machine. Yeah baby! Also, I’d like to thank KTM and Motorcycle Center for hosting this demo ride. 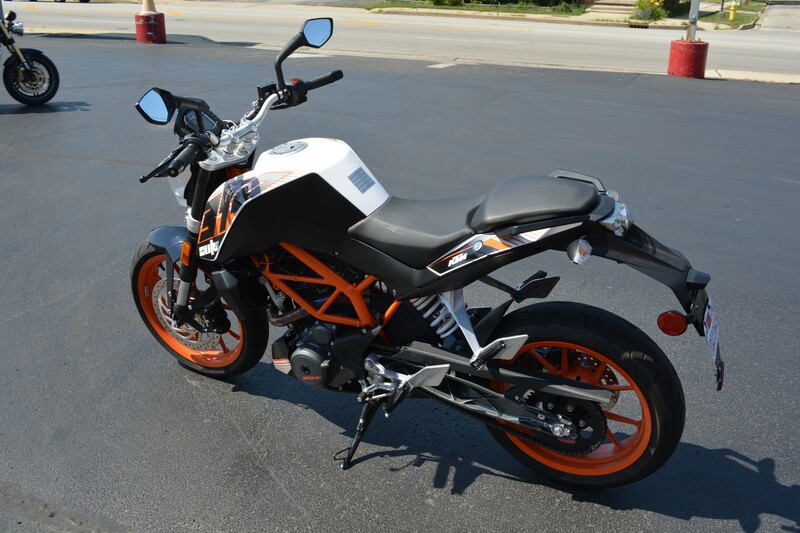 Motorcycle Center is located Villa Park IL and they are KTM dealership.